Utrecht has a long history of silversmiths, dating back hundreds of years. One of the more recent silversmith families was the Brom Brothers, who had a foundry on Keizerstraat. The foundry is no more, but the chimney (schoorsteen) remains and is a favorite of mine to photograph when the sky is blue and bright. If you know more about this history of the building/chimney, please let me know. I’m always interested to learn more! 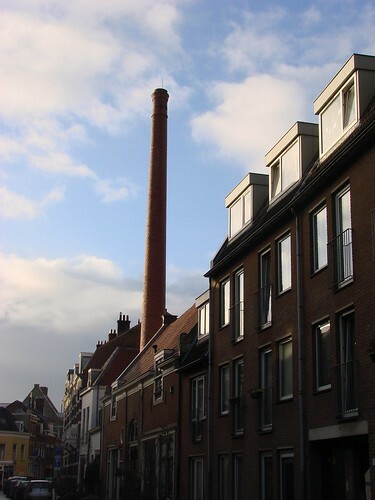 This entry was posted in history, neighborhood, photos, Utrecht Daily Photo and tagged Brom Brothers, chimney, keizerstraat schoorsteen, photos, silversmiths, Utrecht, Utrecht Daily Photo by Alison. Bookmark the permalink. The foundry doesn’t exist, but if they’ve preserved the chimney – what is in that building now? Is it a private house? I love the architecture of the Netherlands! Just beautiful! Thank you for sharing your pictures. Thank you! I’ve always enjoyed history and I find the architecture of a city to be such an interesting representation of its living history. Plus, I just have a fondness for architecture, so it’s always a frequent subject for my camera. I’m sure there will be many more buildings to see, hopefully with a bit of their history, as well. It looks like it’s coming out of one of the houses. Must giver Sinterklaas a hard time every December.